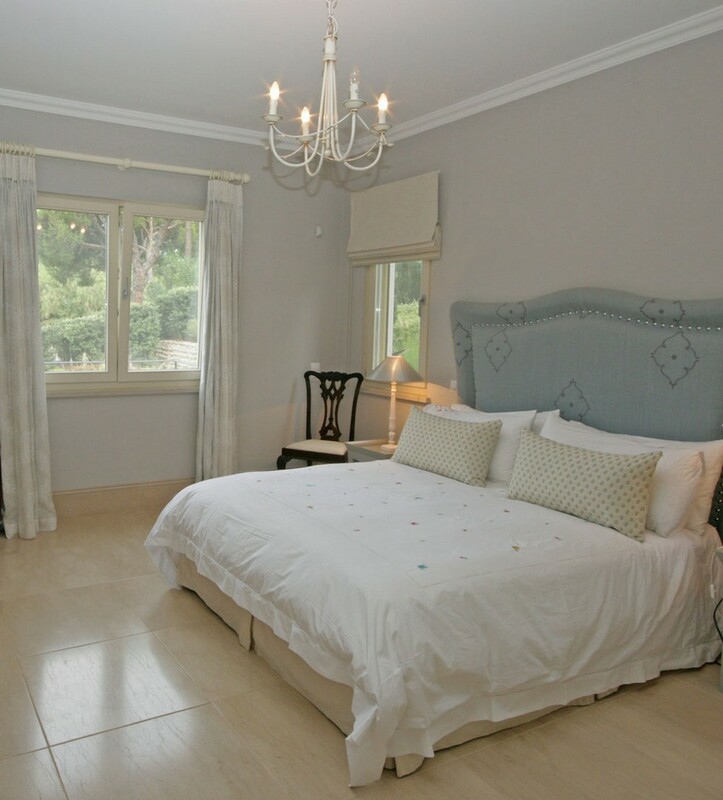 Azure Holidays are very pleased to present this wonderful 5 bedroom villa in Quinta do Lago. Large villas in Portugal do not come more amazing than this! 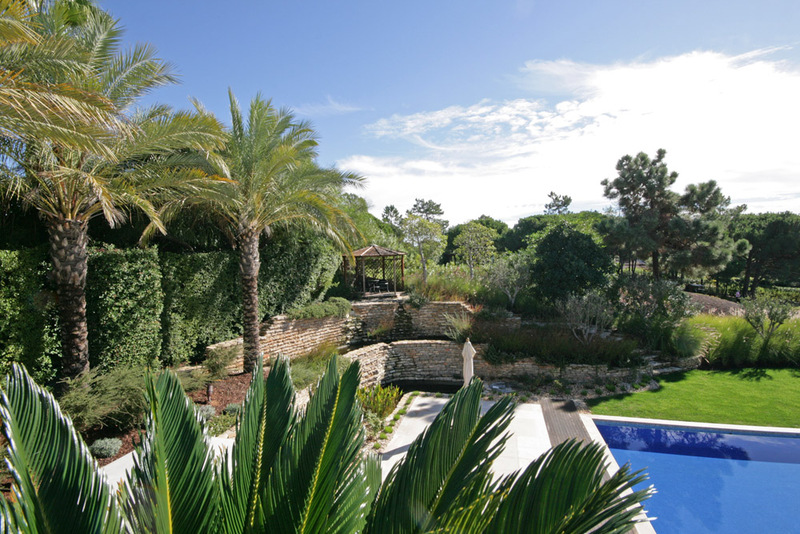 Close to Quinta shopping, this villa has a private pool and luxurious interior design to rival any ‘A list’ house. Ask Azure "This villa is amazing, managing to combine a fantastic Quinta do Lago location and a feeling of remote seclusion. 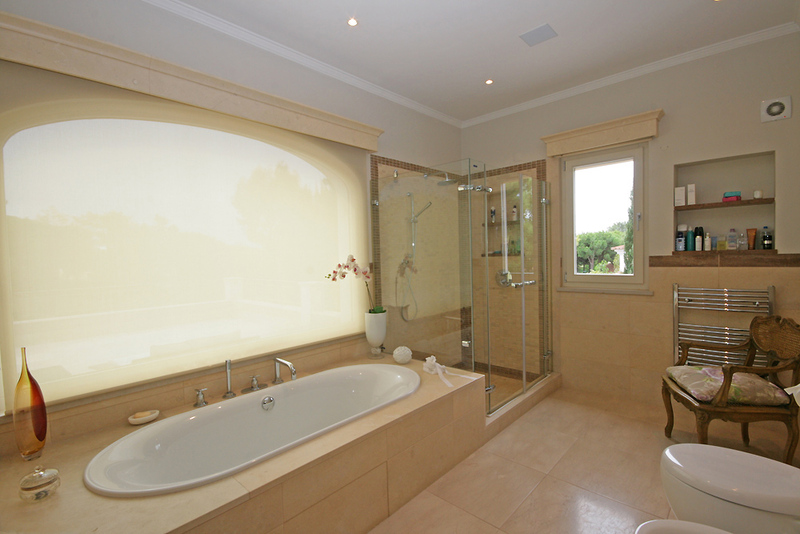 Luxurious and relaxing, returning to this villa after a long day of Quinta shopping makes the lighter wallet worth it! Relaxing in the large private pool or the peaceful garden pergola recharges the batteries perfectly ready for nearby golf or beach front fun!" The large garden at the rear of the property has been very well designed turning this space into something incredible. This is most visible along the left side of the garden and the bottom left corner, where thick hedges and palm trees edge the garden. A feature has been made of this section of outside space with a beautiful stone wall and steps, rising up to a pergola that sits at the highest point of the garden, created to perfectly enjoy the warmth of the setting sun. Curl up with a good book, or even have an afternoon siesta in this wonderful spot while you listen to the soothing water falling over the stone walls. Along the back and right side of the garden, the property boundaries are marked with tall hedges and mature trees and shrubs providing a natural layer of security and privacy. The garden has several outdoor art features such as large urns and flowerpots. The well maintained lawn is an inviting spot, perfect for a picnic. As you are looking at the villa you notice the beautiful mauve tone to the paintwork that gives a charming regal feel to it. The large glass patio doors with their arched windows at the top complement the pillars that hold the terrace roof giving an altogether luxurious and yet traditional style to the building. Under the left side of the terrace there is a luxurious outside dining area with a fabulous table and chairs, perfect for those summer alfresco meals. To the right side of the terrace is a seating area with very comfortable garden furniture, offering a lovely place to relax and enjoy the Portuguese sunshine in the shade. As the terrace continues around the corner you will see another dining table, this one is circular and provides a welcome spot close to the BBQ and inbuilt wood burning oven -we can almost smell that fresh fish sizzling! It's what summer evenings are made of, friends, family and good food. There are many areas in the garden for just sitting and relaxing, benches and other cosy furniture are there for your enjoyment. 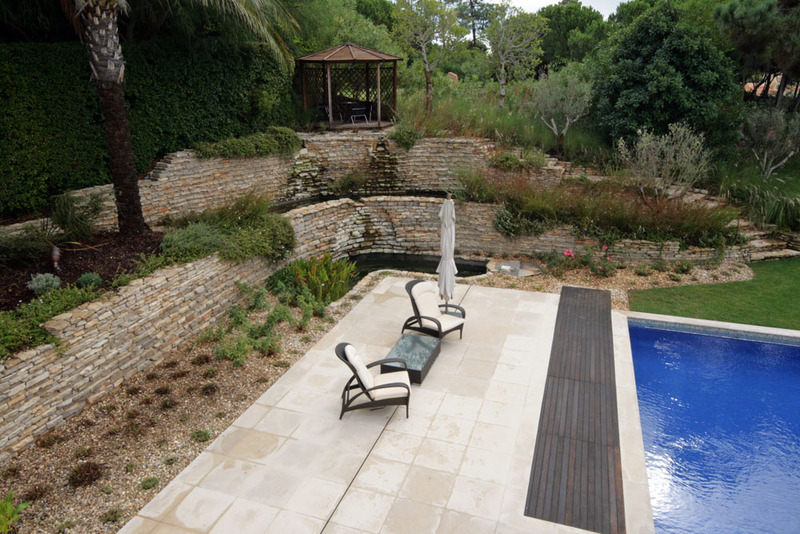 Of course the main feature of the garden is the large pool. 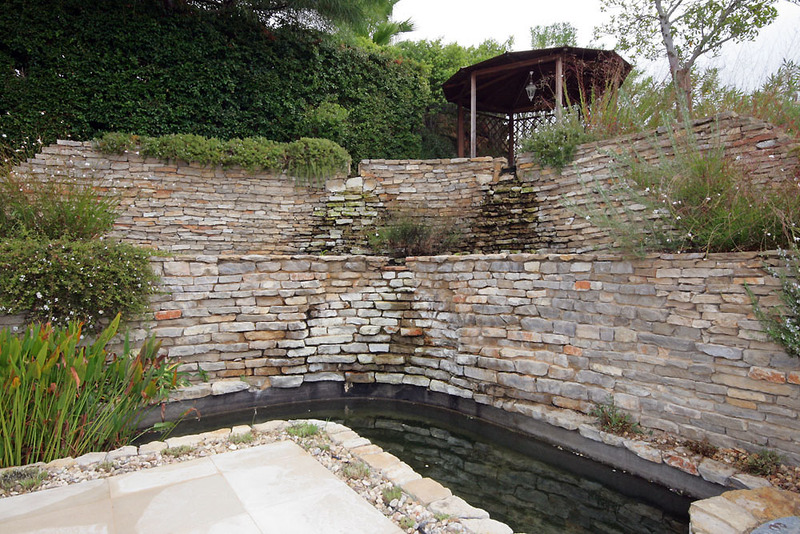 Rectangular with a section for the gradual steps that lead into the pool - this pool is so inviting. As are the many sun loungers that adorn the terrace that surrounds the pool. These luxurious seats would look at home in a spa, and the parasols that are nearby provide that perfect amount of shade when needed. There is also an outdoor shower for you to cool off under, when the weather hits scorching. 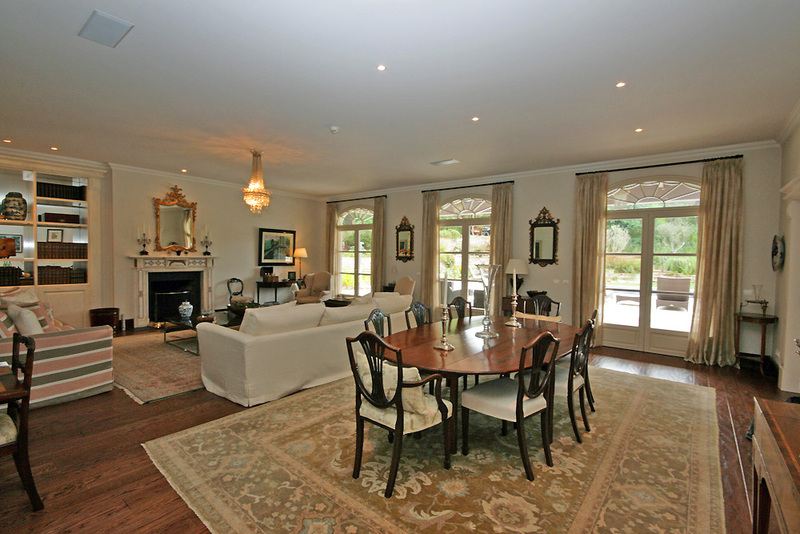 The delights continue as you enter this spectacular property. The grand entrance hall welcomes you in as you get a wonderful view of the upper balcony and the living space in front of you. The stairs rise up to the left taking you to the upper level. The first of the living spaces is the elegant lounge and dining room. 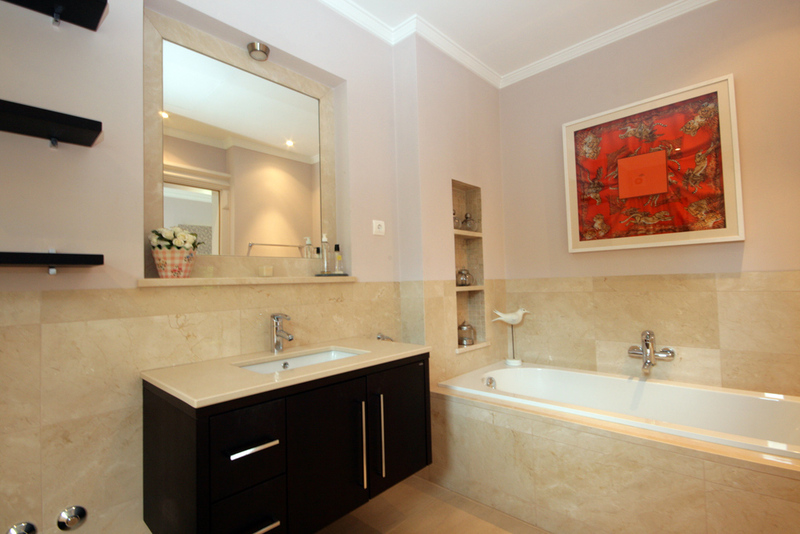 This open plan room is bright and graceful, inviting days and evenings of fun and enjoyment. The comfortable sofas and arm chairs and large coffee table surround the fireplace, whilst the book case and various tables, sideboards and cabinets make this room feel cosy and warm - this is not your average holiday home. 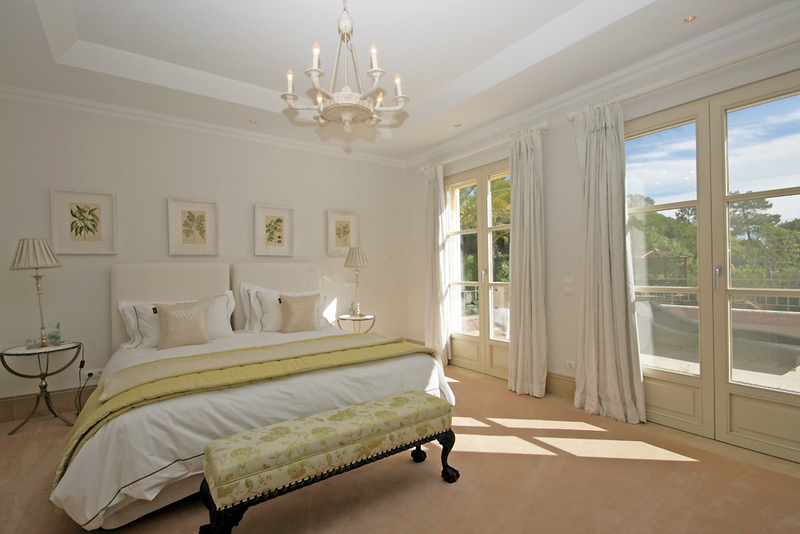 The light streams into this room through three of the large glass doors that open fully out onto the terrace area. The dining table and chairs are in a dark wood which matches the beautiful flooring of this living area. This dark wood contrasts beautifully with the cream of the walls, sofas and cushions and curtains. There is a large open archway with sliding doors that lead into the next room which is the stunning kitchen and second living area. This open plan room has three areas to it. 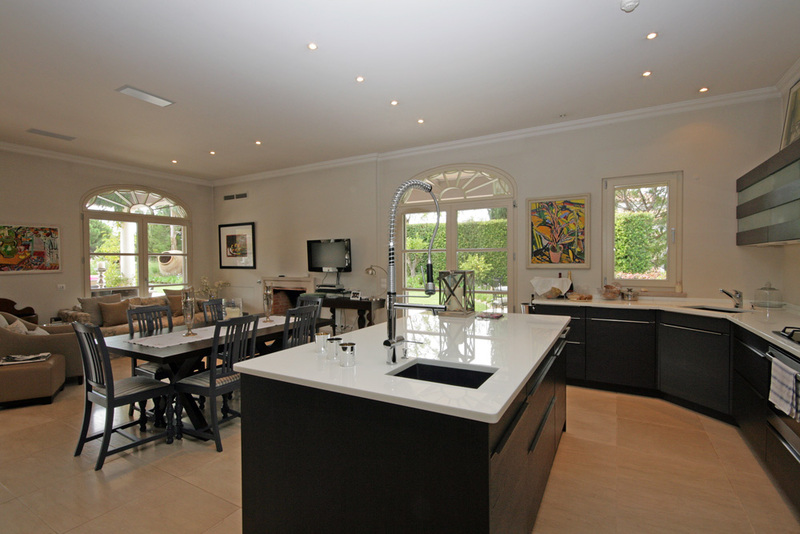 Starting at the back is the incredible bespoke kitchen. This is a room with every possible modern convenience you might need. The dark brown wood of the large cupboards and the stainless steel of the fixtures and fittings are modern and stunning. The white of the work surfaces is just the light touch that is needed. Everything you could want or need is here from a jet spray hose over the sink in the central island, to an inbuilt coffee and espresso machine. Not to mention the gas hob, microwave and oven. This room has a large glass door to the right which gives easy access to the BBQ area, and two more doors at the end of the room leading out onto the patio. The next section of the room is another large table and chairs, this room is sometimes known as the kitchen/breakfast room, and this would certainly be an ideal spot for reading the paper whilst eating some breakfast. The sociable aspect of having a dining table in the kitchen means that whether you are staying here with family or friends, you can all be together whilst preparing a meal. The third part of this room is a set of comfortable sofas and chairs and a TV all set around the fireplace. Altogether this is such a great room with a feeling of fun and informality to it. 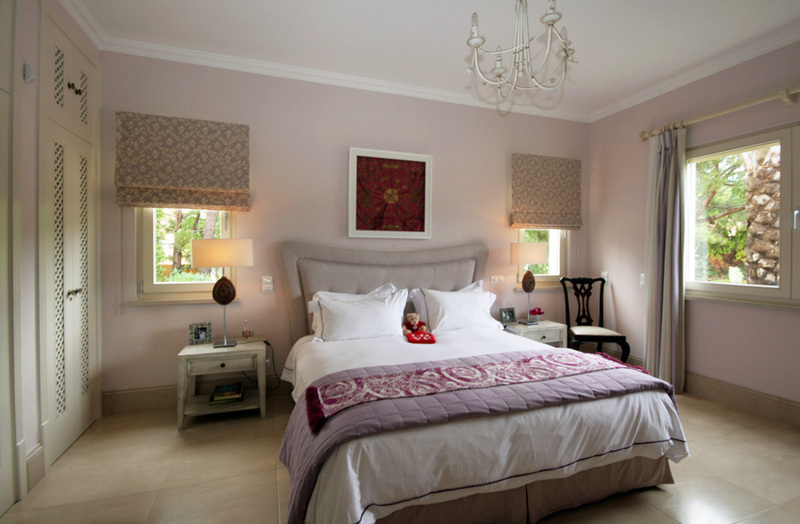 Onto the incredible bedrooms and the stylish decor continues here. 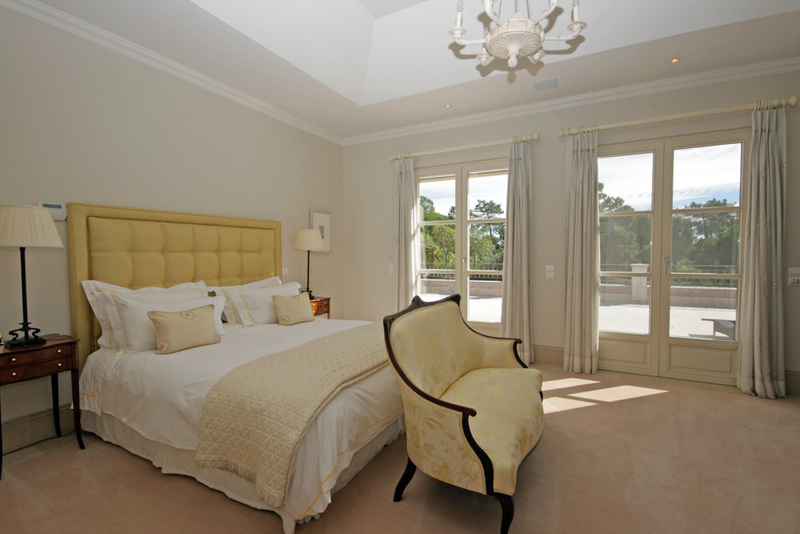 All of the bedrooms are en suite with much attention being paid to creating a space that is luxurious and practical. 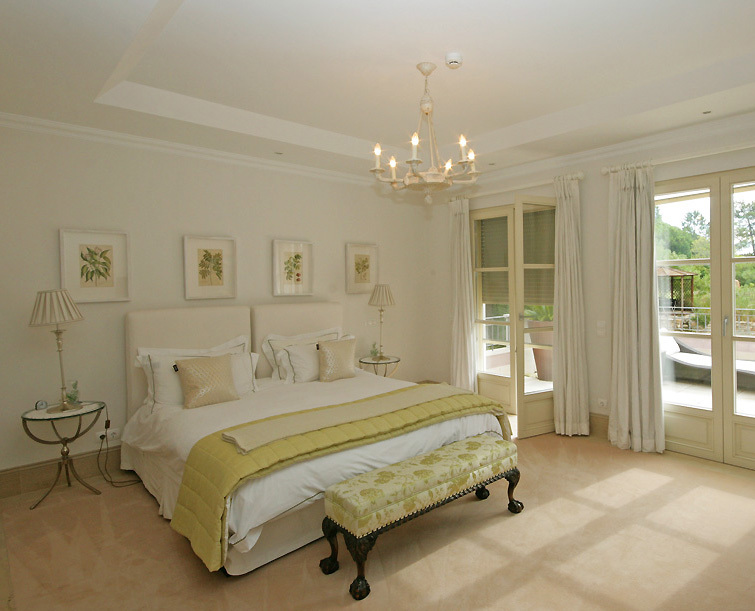 The bedrooms also all have built in wardrobes, perfect for all those extra bargains to be found at Quinta shopping! The first of the two bedrooms are on the ground floor, both are doubles with one full bathroom and the other with a walk in shower room. On the first floor is the glorious master suite. This room has a large king size bed, spacious walk in dressing room with fitted wardrobes and a beautiful en suite bathroom. If that weren't enough there is the incredible sun terrace which overlooks the gardens and Quinta do Lago beyond. The other bedroom on the first floor is equally as stunning, with another double bed, walk in dressing room and en suite bathroom. Most importantly this room also has access to the sun terrace. 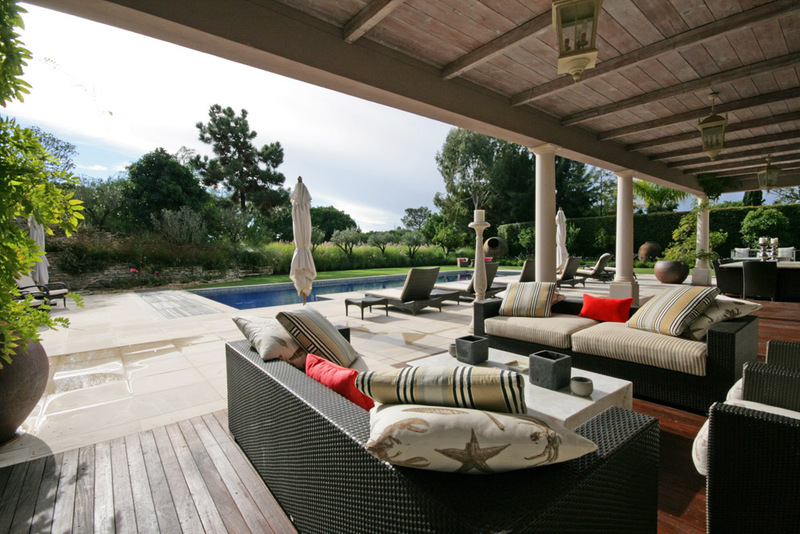 This area has plenty of comfortable outdoor furniture to relax on and enjoy. The final bedroom is down on the lower ground floor. 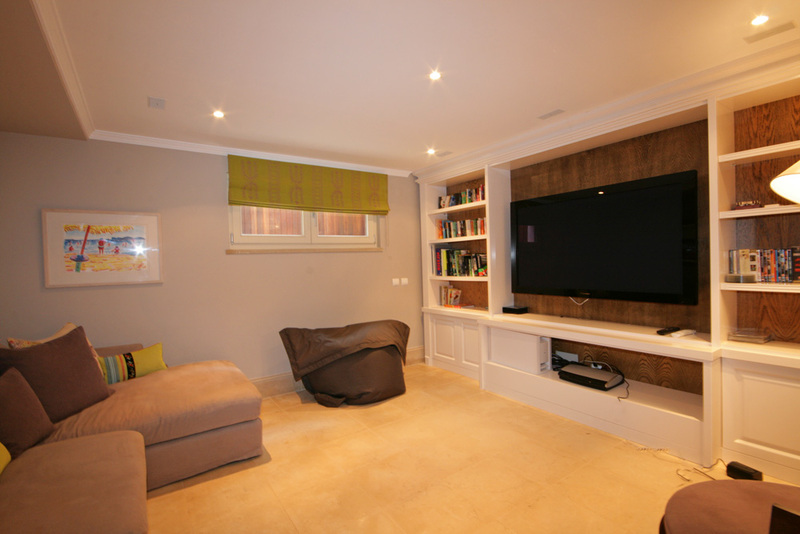 This basement area is also home to the cinema room and utility room. 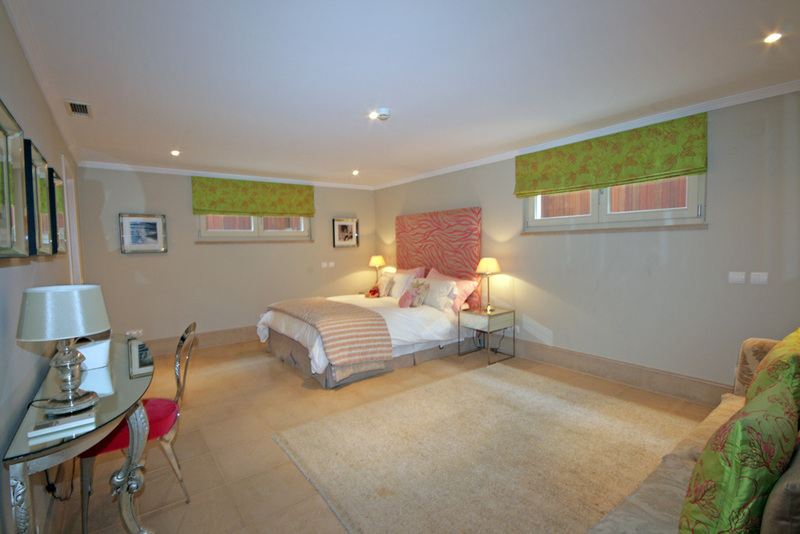 The bedroom is a spacious double with another walk in dressing area and en suite bathroom. The cinema room is cosy and inviting with sofas and chairs and a huge TV with Satellite channels. This is the ideal room perhaps for young people, or those wishing to relax with a movie without disturbing the rest of the house. The utility room is home to the washing machine and tumble drier and other useful items. 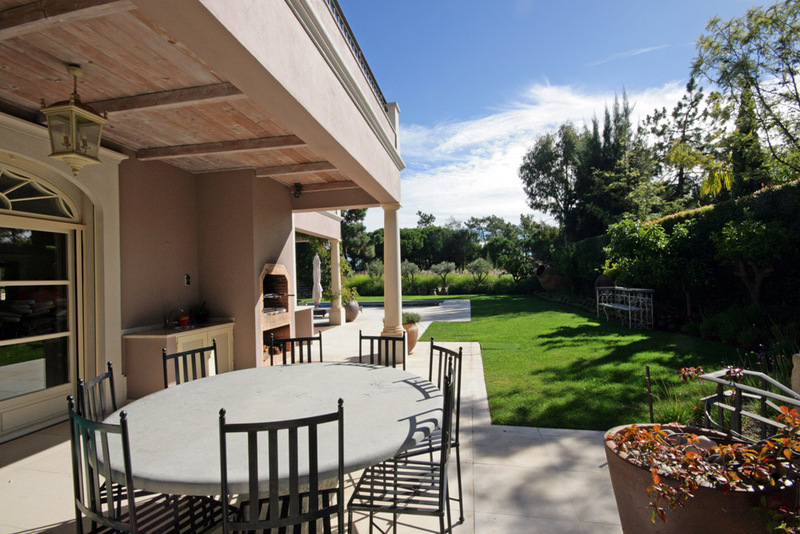 As we mentioned this property is perfect for exploring all that Quinta has to offer in the way of shopping. This also means that you are not only within walking distance of the shops, but also some wonderful bars and restaurants. If golf is more your thing, then you are ideally located as you are right on the Quinta golf course too. This area of the Algarve has so much to offer, and this villa really does give you a great base to explore it all, as well as a welcome return home. If you have any questions about this property then our team of experts are more than happy to help. 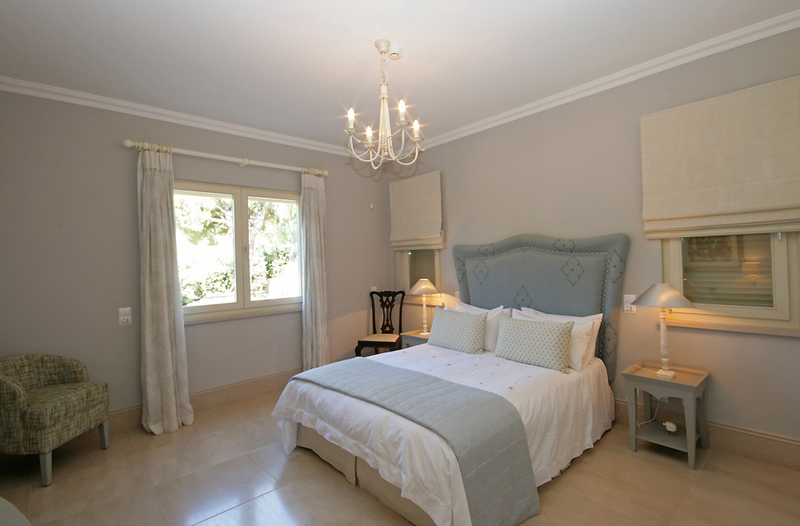 Contact us today, to book this incredible Quinta do Lago villa.